Is your immune system ready for this? Ginger, orange, lemon, and carrot. This potent combination is a delicious way to kickstart your body’s metabolism and energize you from the inside out. Don’t fear the ginger! Though it adds a slight heat, the other flavors keep this juice on the mild side. Lemon brightens the flavor and takes the carrot-y edge off of this juice. It also tones down the ginger just enough. Lemon has powerful antibacterial, antiviral, and immune-boosting properties. It is also known to aid in weight loss and fat metabolism as it promotes healthy digestion and liver detoxification. The Vitamin C, bioflavonoids, magnesium, and limonene boost the immune system. As an added bonus, lemon clarifies and brightens skin from the inside out. 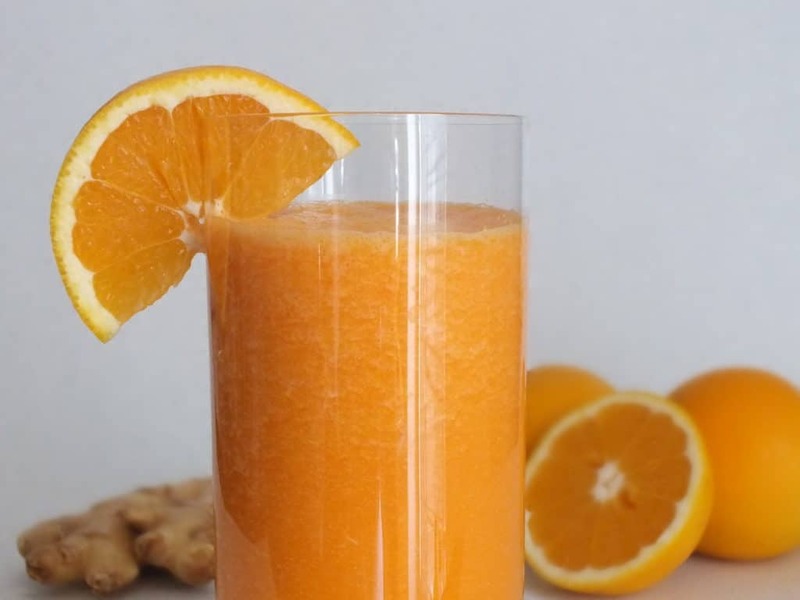 Freshly grated ginger gives this juice a powerful kick in more ways than one. It adds a warmth that seems to energize your body as you drink it in. It boosts metabolism, aids digestion, and detoxifies the blood. It is an antibacterial and anti-inflammatory food, which means it fights off just about any disease or illness. Ginger improves your body’s ability to absorb nutrients, which will help all of the other ingredients to really sink in. Oranges have the obvious benefit of Vitamin C, but that’s not their only positive attribute. One orange provides enough potassium to boost oxygen flow to the brain and a substantial amount of calcium. Recent studies have shown that simply smelling an orange as it’s being peeled is enough to decrease stress levels and fight depression. The niacin content in oranges improves digestion, boosts energy, and clarifies the skin. Sneaking a veggie into the blender with a juice is a great way to up your daily intake. Carrots contain powerful antioxidant beta-carotein [among others] and provide another boost of Vitamin C. Their through-the-roof Vitamin A content benefits eye health. Like most root vegetables, carrot packs a decent amount of iron and magnesium as well as potassium. Thanks to the ginger in this juice, the nutrients will be well-absorbed and put to immediate use by your body. Can we just freeze these and have the kids eat it like a popsicles? Hi Mel – You can certainly freeze it! Do you grate the ginger or can you put it through a juicer with the carrots? Hey Steve! We roughly chop it with a knife and let the blender do the hard work. If your blender is high-speed enough, it should be able to handle it. Otherwise you might need to grate it before adding it. We don’t have a juicer so I’m not sure about that. It probably depends on the juicer. I just made this. It is honestly the most delicious thing ever :-) YUM! Isn’t it the bomb?! It’s so refreshing and tasty!